Space Ghost: Real or Imaginary? The following space ghost statements are extracts from the first spontaneous paranormal survey conducted by Psychic Revolution. These accounts have not been edited but any information that may identify the original contributor has been removed. While touring … my friend and I experienced a cold spot in one of the upstairs bedrooms. We also saw an indentation appear on the side of the bed, as if someone had just sat down. It scared the liver out of us and we ran from the room and down the stairs. The guide told us that we had experienced something that quite a few people had before us. There is a ghost there that is known as the “Gray Lady.” She has appeared in pictures taken of the stairs and has scared plenty of people in that bedroom and in the garden out back. Supposedly, the woman had died in that bedroom. I was at camp. We went for a hike and during this hike I saw a woman in white run across the road ahead of us and then a man running after her. I didn’t think anything of it. I had never been here before. That evening, one of the counselors asked if any of us had seen anything in those woods and where. I raised my hand and told them. They went white. It seems that every now and then, someone would see these two people. They were a husband and wife. The husband had caught the wife cheating on him and chased her into the forest and killed her and then he hung himself in the barn. Where I saw them was exactly where they had been. And what I described them wearing was what they had been found in. i lived in a house that had spirits in it for 20 years. when i first moved in i had a friend spend the night. she went to sleep before i did. i heard marching music in the living room. i heard that at least once a month right up till the day i moved. the next morning by friend heard a voice say mrs so and so where are you? the first week pictures slid off nails on the wall with a loud noisy sound and scared my daughter and me. i’d go to open a door and the handles would fall off or doors would lock when there was no keys to lock them. we would have to take the doors off the hinge and beat the lock out. if friends spent the night someone would tell them to leave or they heard children giggling in the closet, when no childen was in the house. i would get in the tub and the radio would come on in my daughters bedroom when she wasn’t home and i was alone. one night i was home alone and i was woke up by loud talking and i first thought them neightbors are so rude, it’s 3:00 a.m. then i realized the sound was coming from my daughters bedroom. i got up and the t.v. was on. i shut it off and went back to bed. i have got up and went in to the utility room three times because i just knew a animal had gotten in and couldn’t find nothing. i saw black shapes in all the rooms. i got where i would tell the ghost to stop it and it would. i would be setting at my computer and the door knob would pop and i would look at it and see it turn. and it would do it till i told it to stop. i could go on and on with this house stories. the house was built in the 1890,s and has set empty since i moved out. It was 2001 as I was on my way to work. I had been previously drawn to this one area I would pass going to work, especially this one building, it had a name on it and a year, a historical building. Well, on this particualr day, I was driving, and I saw on the side of the road across the street from this building I have been drawn too, was a women standing on the sidewalk. She stood out to me because the best way I can explain her, it was as if she was a black & white photograph. 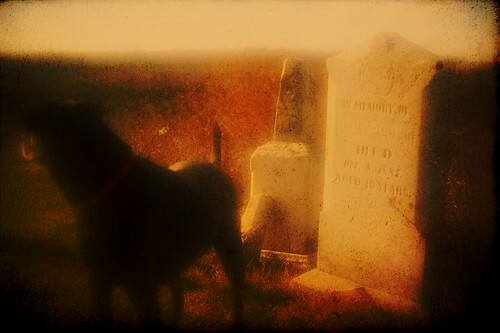 She stood there on the side walk dressed in her 1800 attire, and she had two dogs by her side, one was standing and one was sitting, as if they were posing for a photograph. As I passed her in my car I had the name come into my head Anna. This was the first time I had seen spirit this way, and she was even more different because on her face where her eyes were, they were not there, she had no eyes, instead she had black holes as if her eyes were missing. This freaked me out. I was not afraid of her I was more distressed as to why she had no eyes. To make a long story short, her energy stayed with me for one week, I could feel she gave me aniexty until I discovered who she was and let her go with peace. Finally her last name came to me as it was the building I was drawn too for several months on the way to work. And I too was shown by her where her grave was and I went to the cemetary wtih my mom and son and I walked right up to her stone out of many. I then thanked her for coming to me and wished her to the light. I have not seen her or felt her since. To this day I would like to know why I was drawn to the building. Maybe she knew I could be open to spirit and help her to the light. I needed more confirmation, as I went to the historical soicety in that town and found out the story. Her parents owned the building I was drawn too, it was a general store and they lived there too. She still had relatives in the area that actually gave the society many family antiques, dishes, photo album, ect. I asked the woman at the historical society about her and she confirmed her by name and said she would show me the photo album. I wanted to confirm the fact there was a picture of her at this site with the two dogs. The woman looked for the album, but couldnt not find it at the time because they were moving stuff around, and she asked me to come back and she would show it to me. Regretably, I have not yet gone back to see the album, I plan to do so someday. I personally feel satisfied enough that I found her stone at the cemetary and the lady confirmed her and her family. So I guess that was enough for me. I was playing at my Grandparent’s house when I was about three. A group of elderly people walked up to talk to me. One of the elder women was wearing a sort of navy and gray skirt suit and she was really happy to meet me because I was her great Granddaughter. All of my great Grandparens died before I was born and I didn’t get to see a picture of my Grandfather’s mother until I was much older and could actually see things on the upper shelve of the book shelves. But this woman had matched the picture perfectly – except that she was wearing something different. I was in my late 30’s. Christmas Eve at my sisters house. Everyone (20 people) left to go to Midnight Mass. I stayed back and was reading in her living room. I looked up and saw a woman in what appeared to be a long nightgown moving from a hallway into a bedroom. I called to her, thinking someone must have stayed home. No one answered so I went to see who it was. There was no one else in the house. Honestly, it didn’t even upset me. I worked in a restaurant I which I had many experiences at. I worked every Saturday alone, I had two experiences there with were very exciting to me. I was cleaning the Main Dining room one Saturday, and saw somebody crawling on their hands and knees between two tables. Later that week I found out that my bosses brother use to do this to find change. Well he had past away about a year earlier. Another Saturday I was there alone cleaning the womans restroom, as I was heading for the stall, i was pulled backwards, at first I thought my shirt got hooked onto the double sinks, but I was not close enough to it, so I started heading to the stall again, and I was pulled backwards again, and again I was not hooked onto the double sinks. I told …, who was my boss … dead brother to knock it out. Later I found out that John was a prankster, who loved to tease. I did not feel afraid there at all, all the experiences I had there were fascinating to me, and added to my interest in Ghost Hunting. Same house. I woke up around 4-5 in the morning hearing men talking outside my bedroom window. I got up out of bed and saw two men dressed in odd dark suits. The taller one wore a tall stove-top type of hat and seemed to be in charge. The other one was short and his clothes were more scruffy. He was digging a grave. I can’t tell you why I know this part- but it was clear to me that a young woman had been murdered and they were burying the evidence. At that moment the tall one slowly turned his head as if he knew I was there watching and stared right at me. I have never been more frightened in my life. I ran back to my bed – hid under the covers petrified. In the morning I tried to find evidence, but of course there was none. Over the years I have tried to find information as to any murders in the area but couldn’t find any. To this day the house is uncomfortable – since my parents sold it- a housekeeper has drowned in the pool- the daughter of the man who owned it ended up in an asylum, the man went crazy and destroyed the house and the current owners after putting hundreds of thousands of dollars in renovations- moved out within a month. i was 6 years old at the time one day i was sitting in the kitchen playing with my toys a boy and girl who i later learned died in the house , would come up from the basement and play the 3 of us. told my mom and dad but they didnt respond till one day the boy and girl showed up in front of them , i said see i told you they were real.